Archive Series, David Garcia The old fashioned kind of books with the hard backs and the paper pages one turns, generally by hand, are still important to Danish architect David Garcia, at least as subject matter. 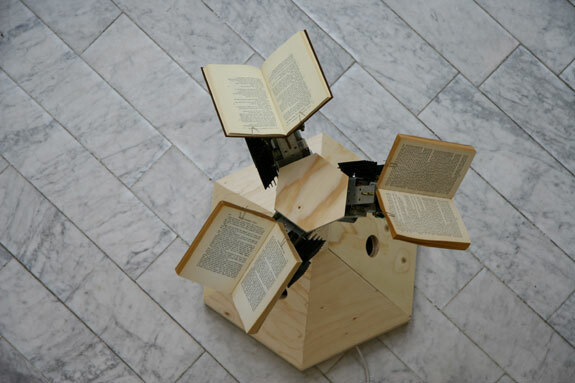 In his Archive Series, Garcia gives books new life by placing them in different surroundings - four vastly different Archives that strike us as three-dimensional poems. The four members of the Archive Series challenge our concept of a library and our relationship to our books. But each Archive challenges Garcia himself with an architectural dilemma, and as observers we find ourselves saying, "That is very cool. But how did he do that?" As an architect, David Garcia shows the ability to come close to defying natural laws. As a conceptualist, Garcia is inspired. Inspired, but accessible, because even though you most likely would not have dreamed the Archive designs yourself, they are so intuitive that you can follow Garcia's thinking right through his creation process. Fortunately, we have all the photos, even those representing the mysterious Archive III - so you can see what I mean. Yes, I'm starting with Archive II, and you will see why later. Archive II is a library for nomads, and for literature professors who love to walk while they read, and for people, just people who want to have a private space, an alcove, to relax and stare into space. 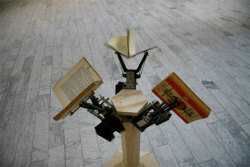 About Archive II, Garcia writes, "The average reader can read about 240 words per minute. A 300 page book normally takes 9 hours to read, non stop. 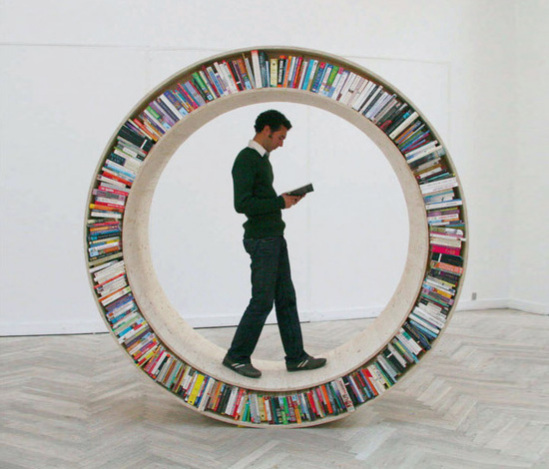 If you read while you walk, you can read a book in about 43 Kilometers. If you read and walk, watch out for traffic." 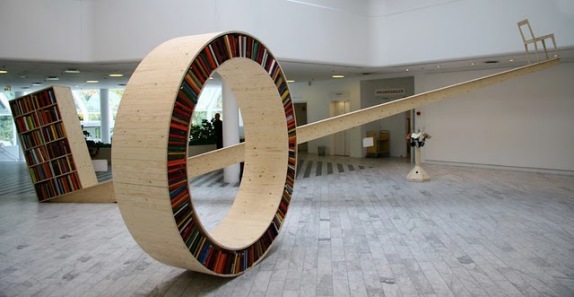 This weight-balanced library had to be achieved by an architect, no doubt. As more books are piled onto the bookcase, the chair rises higher on the beam. I'm not sure I'd want to sit in that chair, but I would like to see Archive I in action! Rarely seen in close-up images, Archive III is a flirtatious tease, guaranteed to make you smile, if not laugh out loud. 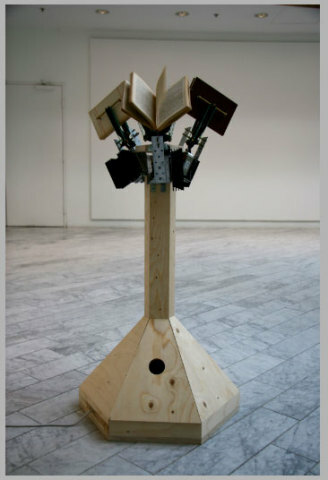 Called the 'censored book stand,' the books, with the help of a little sensor technology, close suddenly if anyone approaches. Archive III, David Garcia Studio: Uh-oh, someone's coming! 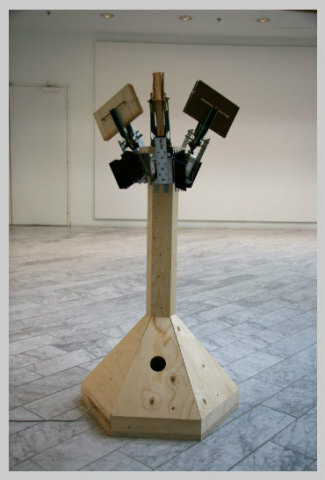 Archive III, David Garcia Studio: No one's around. Archive III, David Garcia Studio: Sorry, this is censored material! Archive IV reminds me of the stacks in my university library where the old books were kept. There wasn't much room to move around, but you did have your privacy. 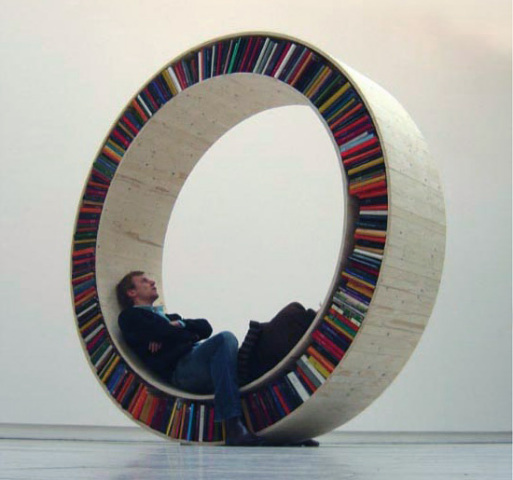 And you could sit on any step you chose if you wanted to read. Garcia's Archive IV is a modern, hanging, version of "the stacks," built with naturally fair-colored plywood - that takes the musty feeling out of searching through old books. 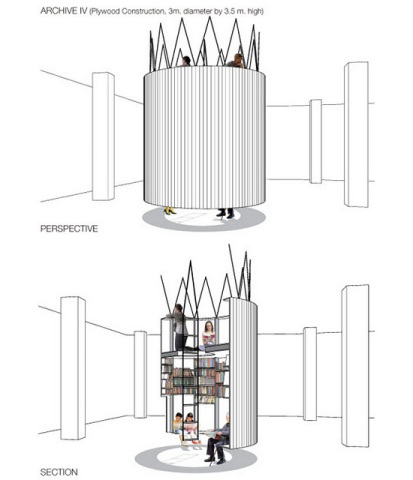 At 12 feet tall and 10 feet in diameter, Archive IV holds small sitting areas, a rope ladder, windows, and, of course an archive for books and music. 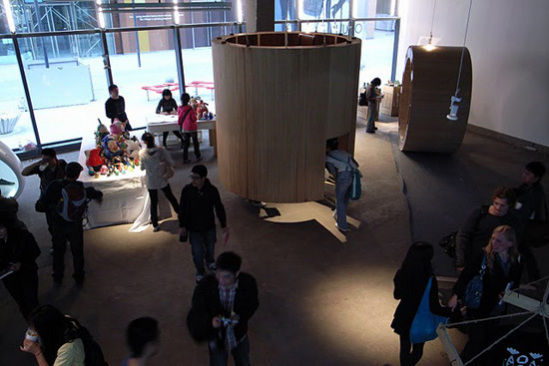 Here it is on display with Archive II at the Notch '09 Festival in Beijing. Here are Garcia's drawings, showing more detail of the inside, as well as how exactly the structure hangs from the ceiling! In addition to David Garcia Studio, an 'experimental architecture' studio, Garcia is an associate at Henning Larsen Architects in Copenhagen. 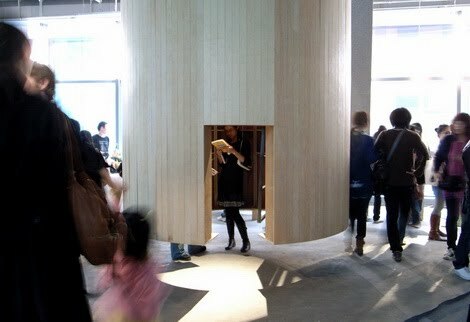 He teaches at architectural schools in Denmark, Sweden, Britain, Norway, and France and has exhibited in Denmark, Beijjing, New York and Chicago. You can see his works at David Garcia Studio. Garcia is also the publisher of MAP, the Manual of Architectual Possibilities, a very exciting look at how architecture can approach a variety of challenges in today's world. If you're interested in architecture or design, I suggest you visit the MAP website, where you can purchase the Manual (a 2-sided laminated paper) as well as add your ideas to whatever projects are ongoing. Thank you, David Garcia for your speedy cooperation with my requests, and thank you Steve Levenstein for bringing the Archive Series to my attention! Wellies That Can Charge Your Phone With Energy Generated During Music Festival Frolicks!